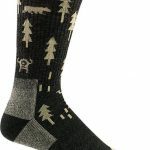 This humble sock has earned a place in the hearts of many a discerning hiker. Cushioning along the bottom of the foot provides the perfect amount of support while a smooth, performance fit assures there’s no slipping, no bunching, and no blisters. 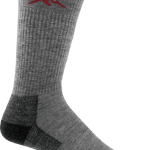 Fine gauge knitting makes this Merino Wool sock a true workhorse that’s supremely comfortable, breathable and fast drying. 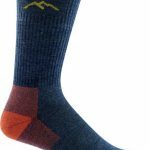 This “all-weather” sock stays cool in the summer and warm in the winter plus it’s naturally antimicrobial so it repels bacteria and odor – a great feature when you need to get any extra day (or two) out of your socks. 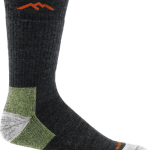 The Regular cusion boot sock is a slightly thinner version of the Full Cushion boot sock, and is ideal for slim-fitting footwear and warmer conditions.